When I started collecting stamps there was a country named Czechoslovakia that was there on the world map since 1918. Initially Czechoslovakia was a part of the greater Austro-Hungarian Empire, but later in 1918 after the WW-I, it declared independence and became a sovereign state. The country since then had gone under difficult times of its history. During the period of the WW-II (1939-45), it bore the wrath of the German invasion and was partially incorporated into the then Germany. After the WW-II, a apart of the Czechoslovakia (to be more precise the eastern part of Carpathian Ruthenia) was taken over by then USSR, while the remaining country continued to be a severing country once again. Since the country mainly consisted of two major parts, i.e. Cesko and Slovensko, the two could not co-exist as one country for long since both were culturally and economically at par with each other. Therefore, after long misunderstandings and bitterness, on January 1, 1993, Czechoslovakia finally split into two independent states: the Czech Republic and Slovakia. My collection of Czechoslovakia is of the times when the country as Czechoslovakia was intact. The stamps date back from 1940s till 1975. For example second stamp from top left column was printed in 1946 as part of a set of seven stamps. Likewise the last stamp in the second columns was printed in 1948 as a part of a set of five stamps. The first stamp in the second column from the left was printed in 1949 as part of a set of six stamps. 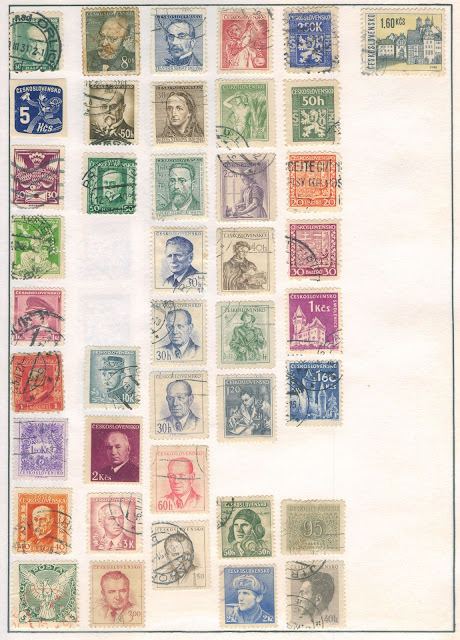 Since most of the stamps on this page of my album are almost of the same period, it is difficult for me to dig out each and every stamp. I would appreciate if someone from Czech Republic helps me out with the history of each stamp. nice article on stamp postal history.